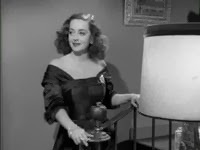 Movietone Newsreel: Hollywood attends premiere of "All About Eve." Margo Channing (Bette Davis) is the brightest star on Broadway. The dynamic, confident and talented actress is about to turn 40. For the first time in her life, Margo is scared. Margo's lover is Ben Sampson (Gary Merrill), a stage director leaving for Hollywood. Margo also depends on her friends, playwright Lloyd Richards and his wife Karen (Hugh Marlowe and Celeste Holm). Margo is about to make a new friend. 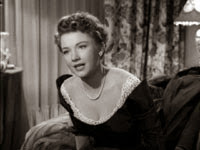 Eve Harrington (Anne Baxter) is a small town girl with stars in her eyes. She saves and scrimps so she can see every performance of Margo's latest play. Every night, she stands at the stage door to catch a glimpse of her idol. One night, Karen invites Eve into Margo's dressing room. Eve quickly enchants Margo and her friends with her naive charm and innocence. Margo doesn't realize that a deadly viper has just entered her lair. Joseph L. Mankiewicz's script still packs a powerful punch 53 years later. "All About Eve" is one of the most intelligent, brutal and humorous scripts ever written. It was the first film script to be published by a major publisher (Random House). Mankiewicz won two Oscars for "All About Eve": Best Screenplay and Best Director. The magnificent cast is rounded out by wonderful actors in peak form. 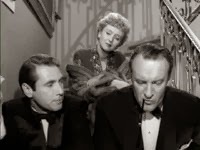 George Sanders won an Oscar as Addison DeWitt, a cynical, cold-hearted theater critic. Thelma Ritter was nominated for an Oscar as Margo's maid. 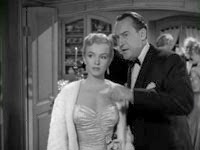 Marilyn Monroe has a significant cameo as a young starlet using important men to further her career. 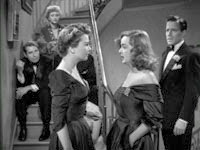 There is not a bad performance in "All About Eve." As good as all of the performances are, the movie belongs to Bette Davis. 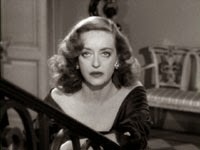 Bette Davis was, for my money, the greatest actress in film history. The pixie of a woman had the most incredible screen presence of any actress on screen. Bette Davis was more than a great actress; she was also a Movie Star in every sense of the word. Bette Davis got the role in "All About Eve" after Claudette Colbert ruptured a disk before shooting was to start. I can't imagine what the movie would have been like without Bette Davis. 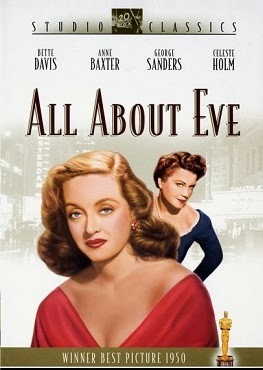 "All About Eve" resurrected Ms. Davisâ€™s Career. One of the greatest travesties in the history of the Oscars is the fact that Davis didn't win her third Oscar for "All About Eve." It will be another travesty if you don't take advantage of FOX's new "Studio Classics" DVD series. 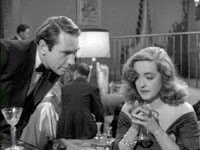 "All About Eve" should be in the DVD library of any serious student of film. This is one of the best. Great movie, picture, sound, extras and price! All this for just $19.98! "All About Eve" won the Oscar for Best Sound in 1950. While the picture was restored through photochemical processing, the original soundtrack was digitally restored by DJ Audio. Original magnetic tape recordings of the actual recording sessions from the movie's score were also transferred digitally. The sound on this DVD is excellent. Amazingly enough, the fact that this disc contains 6 audio tracks (2 commentary tracks) doesn't degrade the quality of either the sound or picture. Nice balance between the ranges. Excellent integration of the bass tones through the sub-woofer. No loss of dialogue. A crisp clear recording. I prefer the Stereo track to the Mono, but both are fine. I have complained in the past that older movies released on DVD didn't take advantage of all of the archived footage used to publicize these films for the "extras" portion of the DVD. Somebody at FOX finally realized this. This DVD contains excellent extras. There are four "Movietone News" features. "Movietone News" reels used to play in movie theaters before the feature presentation. These newsreels cover the premiere of "All About Eve," The Oscars, and two magazine awards ceremonies. They are great for their historical perspective. There are also interviews conducted by Newsweek Magazine with Betty Davis and Anne Baxter from the film's original publicity tour. AMC produces a great documentary series called "Backstory." I try to catch these specials whenever I can. The AMC "Backstory" episode covering "All About Eve" is included on this disc. The episode includes archived interviews with Bette Davis, Joe Mankiewicz, Celeste Holm and Anne Baxter. It also includes new interviews with several film historians and the director's son Christopher Mankiewicz. Lots of great insights and stories about this classic movie. Techies will enjoy the restoration comparison. The feature includes several text screens detailing the long restoration process. This is followed by a split screen comparison of the various stages of "All About Eve's" restoration. One audio commentary track would have been good. "All About Eve" is such an important film that FOX included two tracks! 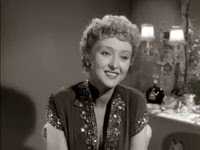 The first track is by a frail sounding Celeste Holm, Christopher Mankiewicz, son of the director and Joseph L. Mankiewicz biographer Kenneth Geist. Mr. Geist gives the viewer insight into not just this film, but the complex and troubled life of Joe Mankiewicz. The second commentary track is by author Sam Staggs. Mr. Staggs wrote the book "All About 'All About Eve'." His track provides a more intensive history of the movie. The DVD also includes the original theatrical trailer as well as sneak peeks at two more of FOX's "Studio Classics Collection": "How Green Was My Valley" and "Gentleman's Agreement." Simple, elegant menu design. No music. The design reflects a bygone era of American filmmaking. Easy to navigate. No Easter Eggs found. FOX has put a lot of love and attention to detail into this DVD. "All About Eve" is a film you can watch over and over without it ever getting stale. If this is the detail that FOX intends to put into each of the 70 odd "Studio Classics" to be released over the next year then they are to be commended and financially supported in this effort. If you don't buy these kinds of DVDs, the studios won't produce them. That would be a shame, because this DVD is more than a great movie. It is a history lesson and a celebration of a type of film that is no longer produced.